Marbella is southern Spain's famous seaside resort on the Costa del Sol in the province of Malaga. It benefits from the protective coastal mountains of the Sierra Blanca and enjoys a particularly sunny microclimate and thus is an ideal choice for a dream golf vacation in the sun. The unique weather of the Andalusian region means you can play golf every day of the year. Even at Christmas short-sleeved shirts for most golfers are the norm. In this the golf Mecca of Europe there's everything for the golfer. The golf courses reflect the diversity of the Andalusian countryside. At times set artistically in the mountains, sometimes along the Mediterranean waters or in unspoilt parkland. The structure of the old town still has the characteristic Moorish irregular street pattern contrasting with the open spaces that were created right after the reconquest by the Christians. In the center of Marbella is the Orange Square, meeting place for Spaniards and tourists alike with the Town Hall as the center piece. Perfect to relax with a drink or just coffee under the orange trees. Nightime here hosts large festivals in true Spanish style. The town hall itself was built in 1485 and the old city walls date from the 16th Century and are still in excellent condition. The church Capilla Santiago Apostol is also from the 16th Century. 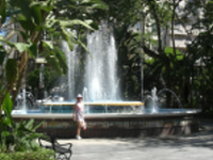 Take the road from the old town to the sea via the tropical park with it's beautiful fountains. Continue on the Avenida del Mar, lined with its unique sculptures by Salvador Dali. This is one of the most beautiful routes through the city. The Avenida del Mar beach opens onto the Paseo Marítimo, where the visitor can experience uninterupted views of the sea. Great to enjoy cozy tapas bars and restaurants. The beach promenade is a full 7 km and leads directly to the famous marina of Puerto Banus. The port was built by José Banús and inaugurated in 1970. Today the port is the meeting point for the "rich and famous". The biggest yachts are up to 70 feet long. Beautiful restaurants and elegant shops line the waterfront. This is Marbella's marina where the Costa del Sol's nightlife will take you into the early hours.